Communication with Extraterrestrial Intelligence is devoted to the concepts and studies related to the science, technology, and observational techniques of communication with extraterrestrial intelligence (CETI). Topics covered range from the search for extraterrestrial intelligence (SETI) to the theory of interstellar communication; the problem of the origin of life; radio signals from extraterrestrial civilizations; and interstellar communication by neutrino beams. An infinitely expandable space radiotelescope is also described. This book is comprised of 21 chapters and opens with a discussion on the CETI activities of the International Academy of Astronautics (IAA) from 1965 to 1976 and describes the outlook for the IAA CETI Standing Committee. 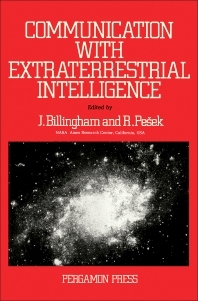 The following chapters sketch the background and rationale for a SETI program; the significance of the detection of signals and of information that may be contained in signals from extraterrestrial civilizations; an extended Drake's equation, the longevity-separation relation, equilibrium, inhomogeneities, and chain formation; and the physical and psychological basis for the belief that a band of frequencies called the water hole is a prime band for SETI. This monograph will appeal to practitioners in the fields of astrophysics, astronomy, planetary formation, exobiology, and biological evolution.